North Borneo was an independent state and British protectorate under the sovereign British North Borneo Company from 1882-1946, and subsequently a crown colony of the United Kingdom from 1946-1963. It is located on the northeastern end of the island of Borneo. It is now the state of Sabah, East Malaysia. In 1865, the United States Consul to Brunei, Charles Lee Moses, obtained a 10-year lease for the territory of North Borneo from the Sultan of Brunei. However, the post-Civil War United States wanted nothing to do with Asian colonies, so Moses sold his rights to the Hong Kong-based American Trading Company of Borneo owned by Joseph William Torrey, Thomas Bradley Harris, Tat Cheong and possibly other Chinese merchants. Torrey began a settlement at the Kimanis River mouth, which he named Ellena. Attempts to find financial backing for the settlement were futile, and disease, death and desertion by the immigrant labourers led to the abandonment of the settlement towards the end of 1866. With the imminent termination of the lease at hand in January 1875, Torrey managed to sell his rights to the Consul of the Austro-Hungarian Empire in Hong Kong, Baron Von Overbeck. Von Overbeck managed to get a 10-year renewal of the lease from the Temenggong of Brunei, and a similar treaty from the Sultan of Sulu on January 22, 1878. To finance his plans for North Borneo, Overbeck found financial backing from the Dent brothers (Alfred and Edward). However, he was unable to interest his government in the territory. After efforts to sell the territory to Italy for use as a penal colony, Von Overbeck withdrew in 1880, leaving Alfred Dent in control. Dent was supported by Sir Rutherford Alcock, and Admiral Sir Harry Keppel. In July 1881, Alfred Dent and his brother formed the British North Borneo Provisional Association Ltd and obtained an official Royal Charter November 1 the same year. In May 1882, the British North Borneo Chartered Company replaced the Provisional Association. Sir Rutherford Alcock became the first President, and Alfred Dent became Managing Director. In spite of some diplomatic protests by the Dutch, Spanish and Sarawak governments, the British North Borneo Company proceeded to organize settlement and administration of the territory. The company subsequently acquired further sovereign and territorial rights from the sultan of Brunei, expanding the territory under control to the Putatan river (May 1884), the Padas district (November 1884), the Kawang river (February 1885), the Mantanani islands (April 1885), and additional minor Padas territories (March 1898). The Company established a foundation for economic growth in North Borneo by restoring peace to a land where piracy and tribal feuds had grown rampant. It abolished slavery and set up transport, health and education services for the people. Chinese immigrants were wooed to boost the small population of less than 100,000. Through the combined effort of the locals and immigrants, towns, farms, a timber industry, tobacco and rubber plantations began to thrive. In 1888, North Borneo became a protectorate of Great Britain , but its administration remained entirely in the hands of the British North Borneo Company, with the crown reserving only control of foreign relations. From 1890-1905 the British government placed the colony of Labuan under the administration of North Borneo. The Company's rule in North Borneo had great impact on the development of the region. Although was generally peaceful, the local population occasionally resented the imposition of taxes and the loss of land to European plantations. The most serious resistance was the Mat Salleh (Mahomet Saleh) War from 1894-1900, and the Rundum Uprising by the Murut in 1915. The Chartered Company's system of administration was based on standard British colonial administration structures, with the land divided into Residencies, and sub-divided into Districts. Initially, there were only two Residencies: East Coast and West Coast, with Residents based at Sandakan and Jesselton respectively. Each Residency was divided into Provinces, later known as Districts, which were run by District Officers. By 1922, there were five Residencies to accommodate new areas that were opened up for development. These were the West Coast, Kudat, Tawau, Interior and East Coast Residencies. These Residencies were in turn divided into 17 Districts. Under this system, British held top posts, while native chiefs managed the people at grassroots level. This was not a conscious attempt by the British to instil indirect rule but a convenient arrangement for the District Officers who were unfamiliar with local customs and politics. The British North Borneo Company effectively ruled until January 1, 1942. Japanese forces occupied Sabah from 1942-1945. The North Borneo Armed Constabulary with only 650 men hardly provided any resistance to slow down the Japanese invasion. During Japanese military occupation, the Europeans were interned, public services ceased to exist, and there were widespread poverty, disease and malnutrition. In June 1945 the Australian 9th Division landed in Brunei and liberated much of North Borneo before the end of the war. North Borneo was placed under British Military Administration until restoration of civil government on July 15, 1946. The British North Borneo Company did not have the financial resources to reconstruct North Borneo after the destruction of World War II. 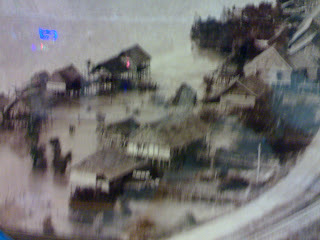 The major towns had been razed to the ground by allied bombing, and the infrastructure of North Borneo was in total devastation. The British North Borneo Company decided to sell its interests to the British government. The territory was placed under control of the colonial office, and became a British crown colony on July 15, 1946 together with islands of Labuan. 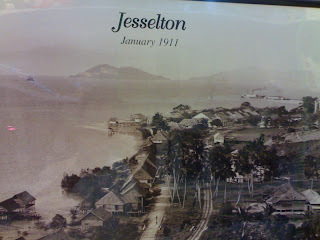 The destruction of the former capital Sandakan was so complete that Jesselton was chosen as the new post-war capital. The colonial system of administration was in most ways similar rule during the Company era, retaining the same Residency and District structure; however, as a result of this change in status, North Borneo had access to British government funds for reconstruction. A Governor and Commander-in-Chief was appointed to administer the colony of North Borneo with the assistance of an Advisory Council consisting of three ex-officio members: a Chief Secretary, the Attorney-General, and the Financial Secretary, together with other members both official and unofficial whom the Governor chose to appoint. In 1950, the Advisory Council was replaced by the Executive and Legislative Councils. The Executive Council functioned as a Cabinet and was headed by the Chief Secretary. In addition to the Attorney General and the Financial Secretary, it consisted of two officials and four nominated members. The Governor presided at the Executive Council meetings and he alone was entitled to submit questions to the Council. The Legislative Council consisted of the Governor as President, the usual three ex-officio members, nine official members and ten nominated members. The high-ranking administrative posts continued to be held by the British, and in fact, it was only in 1957 that the first non-European filled an administrative officer's post. British North Borneo was granted self-government on August 31, 1963. A little over two weeks later, on 16 September 1963, the state united with Malaya, Sarawak and Singapore, forming the Federation of Malaysia. North Borneo is part of the Sulu Sultanate, The Philippines! Malaysia is illegally occupying North Borneo!